DUG Insight User ManualFrequently Asked QuestionsFrequently Asked Questions ProcessesHow do I filter large amplitudes, extreme values and spikes from my data? 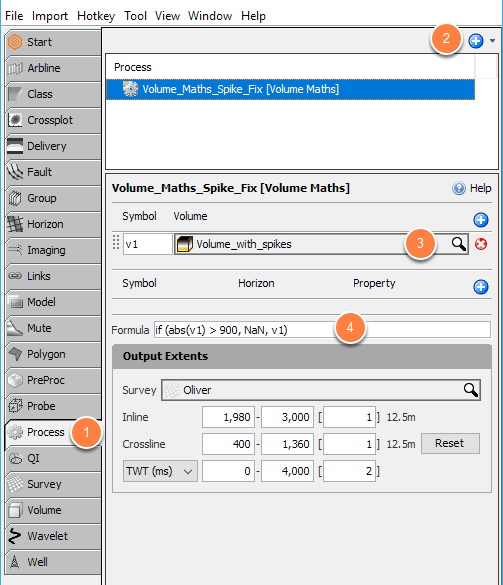 Volume Maths is a very usefull process in Insight that allows manipulation of seismic data (to a certain degree). In this instance, we will use Volume Maths to identify large amplitudes, extreme values and/or spikes and replaced it with NaN values. We can then interpolate these NaN values using the NaN Removal process to repair the volume. For this situation, we use the logic that if values in volume v1 are greater than 900 (or a more suitable extreme number for the volume) replace it with NaN, if not use v1 (input values). Open the Process tab and click the "+" button to add a New Process. Search and select Volume Maths. Type in a name for this Volume Maths process. 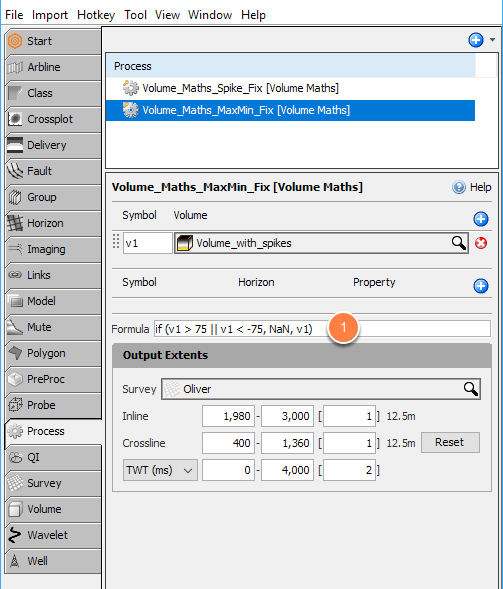 In the Volume Maths panel, click the "+" button and select the abnormal volume. In the Formula text box, enter the formula: if (abs(v1) > 900, NaN, v1). To crop on specific high min and max values, use the logic that if input volume v1 is greater than 75 (or a suitable max value) OR if v1 is less than -75 (or a suitable min value), replace with it NaN, othewise use v1 (original value). Add formula if (v1 > 75 || v1 < -75, NaN, v1) in the Formula text box of the Volume Maths panel. Interpolate NaN values using the NaN Removal process. In the Process tab, click the "+" button and add a new process. Search and select NaN Removal. Type in a name for this NaN Removal process. 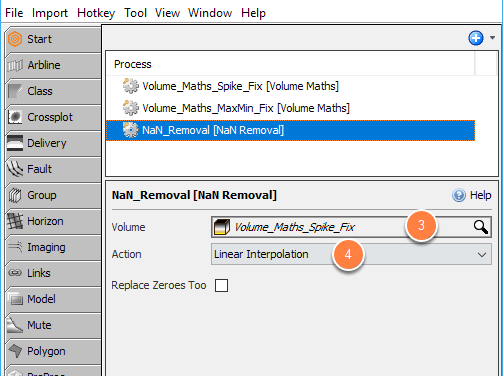 Under the NaN Removal panel, select the volume created from the above Volume Maths process in the Volume text box. Select Linear Interpolation from the Action drop box. Read more about NaN Removal process. A volume is created and is available in the Volume tab. Next: When should I choose a Dip filter over an F-K filter?